By-elections for 36 seats in the National Assembly and the Zanzibar House of Representatives on May 18 gave some very clear indications as to the present strength of the two main political parties in Tanzania and what might happen in the next general elections due in 2005. By winning comfortably in four by-elections on the mainland the ruling Chama Cha Mapinduzi (CCM) party indicated that it is still in command of the political scene. The opposition is still way behind in popular support. President Mkapa retains his popularity and many will be sorry to see him go when his second term ends in 2005. He cannot stand for a third term. But in the Zanzibar island of Pemba the results were spectacular. Voters overwhelmingly demonstrated their support for Tanzania’s main opposition party, the Civic United Front (CUF). The Commonwealth Observer team, whose predecessors in the general election in 2000 described that election as being ‘in many places a shambles …. a colossal contempt for ordinary Zanzibar people and their aspirations for democracy’ this time praised the elections as being credible in terms of transparency, electoral management and the overwhelming turnout of voters. 107,074 people registered to vote out of an estimated 140,000 eligible and in the elections themselves a remarkable 93% of those registered turned out to vote. The Commonwealth observers were full of praise for the newly reformed Zanzibar Electoral Commission and its conduct of the elections. CUF won all 15 Zanzibar seats in the Union parliament and 11 out of the 17 seats in the House of Representatives. It should have won all of the latter as well. However, the CUF candidates were barred in six seats after the NCCR­Mageuzi, a relatively insignificant opposition party, cited a section of the Zanzibar constitution that bans any MP who has been dismissed by the Speaker of the House of Representatives (for failing to attend three consecutive sessions) from seeking re-election for three years. The six were among the 17 elected CUF MP’s who boycotted the House to protest against the alleged rigging of the 2000 general election. Most of the electorate in the six seats responded to the barring of the CUF candidates by spoiling their ballots rather than vote for CCM. In Chake Chake, for example, out of 5,910 votes cast, 4,385 were spoilt. NCCR got 183 votes. The six seats were however won by CCM but its best winner scored just 23% of the votes cast. CUF Chairman Pro£ Ibrahim Lipumba commented: “If we want any evidence that CCM stole the 2000 elections the result in the Mkanganyeni constituency is it” (a view contested by CCM). This was a seat won by CCM’s Dr Ali Mohamed Shein in 2000, who later had to vacate the seat when he became Vice-President of Tanzania. This time the CUF candidate took the seat comfortably with 66% of the vote. The elections marked an important development in the implementation of the “Muafaka”, an agreement signed between CUF and the CCM, after post­election protests turned violent in 2001 and led to the death of some 40 CUF supporters at the hands of the police. Following these by-elections it seems that in 2005 CCM can look forward again to success on the mainland. But for it to win in the Isles, if the election is free and fair, will be something of a struggle. CUF needs to win only a few seats on the sister Zanzibar island of Unguja to win control of the Zanzibar House of Assembly and probably the presidency of Zanzibar as well. According to a Statehouse press statement on August 24, President Mkapa has been suffering from arthritis for the last few weeks and has been attending physiotherapy exercises. The President went to the airport to welcome only two of the 14 heads of states and Governments who arrived for the first SADC summit to be held in Tanzania on August 25 and 26. Vice President Ali Mohamed Shein, Prime Minister Sumaye and other senior ministers received the other foreign dignitaries -Nipashe. The Guardian has reported that the major opposition parties reached an agreement on August 23 to harmonise their relations and reinforce unity as part of the preparations for the 2005 elections. But then CHADEMA announced that it would field its own presidential candidate in 2005. 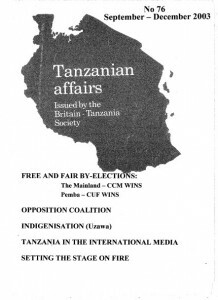 In the 2000 elections CHADEMA supported CUF’s candidate for president. Then a member of the East African Legislature from the NCCR-Mageuzi party, Mabere Marando, sprang a surprise on his fellow party members by praising the CHADEMA party and promising to help it by contributing funds. Thereupon NCCR National Executive Committee Member and Regional Secretary for Iringa, Eliud Mvella, told the press that Marando would be expelled and would lose his seat in the EA legislature. MP’s in the newly expanded 34-member opposition camp in the National Assembly in Dodoma have joined together to appoint a shadow cabinet. This followed the expulsion of two United Democratic Party (UDP) MP’s following internal clashes. The two lost their seats when they were expelled after trying to dislodge the founder of the party John Cheyo. Another legislator, Zamda Bozeni, who had been suspended by CUF also returned to the fold after winning a case against the party in court. Wilfred Lwakatare (Bukoba Urban -CUF), is the new leader of the opposition camp taking over from Dr Walid Kabourou (CHADEMA) who had been suspended by the Speaker of the Assembly. The Deputy leader is Isaac Cheyo (Bariadi West -UDP) and the Chief Whip is Thomas Ngawaiya (Moshi Rural -TLP). Philemon Ndesamburo (CHADEMA) represents Tourism and Natural Resources but almost all the other cabinet members come from the increased number of CUF MP’s following the by-elections. Some MP’s are requesting the Government to consider the issue of introducing private candidates without party affiliations in local and general elections. Under existing rules private candidates are not allowed. Prominent lawyer and CCM advisor Masumbuko Lamwai has said that the time has come for constitutional changes to accommodate private candidates. Responding, while presenting his ministry’s expenditure estimates for 2003/2004, Justice and Constitutional Matters Minister Bakari Mwapachu said the Government had prepared proposals for constitutional changes and would hand them to parliament later for more scrutiny -Majira. As this issue of TA went to the printers it was reported in Majira that Bukoba Urban CUF MP Wilfred Lwakatare was in police custody following disturbances caused by CUF members demonstrating in Bukoba town. Prior to the arrests police had used tear gas and live ammunition to disperse the CUF members. He said police permitted CUF to hold the rally but party followers became unruly and used stones to break windscreens of cars, including a police car. The opposition Shadow Minister of Foreign Affairs and International Co­operation, Khalifa Suleiman Khalifa, has criticised the Tanzania Government’s support of President Mugabe of Zimbabwe, saying it was not fair for Tanzania to identify itself with people who opposed ‘the wind of democracy which was sweeping across Africa.’ He attributed the Mugabe problem to the trend towards overstaying in power and called on other African leaders to take Zimbabwe as a warning. Khalifa commended Presidents Benjamin Mkapa and Joaquim Chissano (of Mozambique) for their unflinching decision to retire when their time was due. Two new political parties have been registered in Zanzibar bringing the total number of parties in Tanzania to 18. They are ‘Solidarity of Force 3’ (SOFT) and ‘SAFINA’. The leaders of both parties originally belonged to CUF before defecting to CCM. Both parties have said that they want to guide Zanzibar to a ‘new beginning’ and that CCM is out of touch. On July 18 the Swahili press reported that prominent Zanzibar businessman Mohamed Raza, who was Sports Advisor to former CCM Zanzibar President Salmin Amour, had said that the ruling CCM party in the Isles was now split into two groups. He said that one group was currently in power while the other represented those who were previously in power during President Amour’s time. He said the situation was becoming critical and that if elections were held in the islands today the opposition CUF would win. CCM leaders reacted by saying that Raza was ignorant in politics and also on the constitutions of the CCM and of Zanzibar. Deputy CCM Secretary General, Zanzibar, Saleh Ramadhani Feruzi said that Raza had always been an impatient person and denied his allegations that CCM Zanzibar was mistreating former President Amour and that the party was divided. Some observers however began putting two and two together and coming to the conclusion that at least one of the two new parties referred to above might comprise dissident CCM members. There has been some controversy about the two special (nominated) Zanzibar House of Assembly seats, which, under the constitution, are granted by the Isles presidency, to the opposition. President Karume hesitated for some time before awarding one to CUF but seemed to hold out in the case of the second. Some of the very small parties in Zanzibar had been carrying out a vociferous campaign demanding that they should be awarded the other seat. A decision is awaited. CUF National Chairman Professor Ibrahim Lipumba was questioned by police for three hours on July 25 as was the party’s Deputy Secretary General, Juma Duni Haji. The questioning was said to be in connection with speeches made at a CUF rally. Duni was quoted as having admitted he received a letter from Senior Assistant Commissioner of Police Ramadhani Kinyogo calling on him to report at Police headquarters in Zanzibar. He said reasons for the summons was not revealed but that he suspected it had something to do with the recent remarks made by Professor Lipumba at the Zanzibar rally. He admitted that remarks annoying to the Government were made at the meeting, adding that they would continue making them. Later the Police said it was satisfied by explanations and answers given by Professor Lipumba but added that should there be any eruption of violence they would take legal measures against him -Mtanzania. Security was stepped up at the Dar Es Salaam International Airport after State Minister in the Vice President’s Office (Poverty Eradication) Edgar Maokola-Majogo was found in New Delhi, India with a bullet in his bag. Maokola-Majogo had passed through the Dar airport without detection of the bullet by the electronic surveillance equipment installed there. A Majira reporter witnessed security agents at the airport inspecting everyone. Airport Director Ms Faraja Makasi said the incident was just a normal technical problem which could happen anywhere and that was why even Zurich airport security systems couldn’t detect the bullet either. She said airport employees were undergoing further training on security matters. Sokoine University of Agriculture (SUA) experts, in collaboration with Belgian scientists, are training rats for use in bomb disposals. The SUA experts said that the rats had proved to be efficient and better than dogs. They could detect buried land mines -Mwananchi. The Government has been under sustained attack in parliament and elsewhere over the performance of the Parastatal Sector Reform Commission (PSRC). Some MPs demanded to see all the contracts that the PSRC had entered into for the sale of parastatals. Minister of State (President’s Office) Planning and Privatisation, Dr Abdallah Kigoda, assured Parliament that the activities of the PSRC would be evaluated. President Mkapa opened the new $30 million 970-metre-long Rufiji Bridge on August 2nd. It was described in the Guardian as possibly the best and longest overpass in the East and Central African region. It is expected to greatly ease the chronic transport problems in the southern regions of Tanzania. CCM efforts to make the ceremony into a CCM occasion were frustrated by CUF supporters who pulled down CCM flags. Opposition has been growing to the continued heavy payments being made by the Government to Independent Power Tanzania Ltd (IPTL) -see Tanzanian Affairs No 75. Business News reported on July 25 that the Parliamentary Sectoral Committee on Investment and Trade had described the monthly bill of2.5bn/-, which TANESCO pays to IPTL, as economic sabotage and had demanded disciplinary action against those involved in signing the contract. Opposition spokesman for the ministry, Issac Cheyo (Bariadi East -UDP) asked what disciplinary measures had been taken by the Government against the officials who signed the IPTL contract. On August 14 the Guardian reported that IPTL, the thermal power generation plant in Dar es Salaam, was to be converted into a gas firing plant. The government announced the setting up of a commission to study conversion of the plant which had begun commercial operation in January last year. IPTL sells electricity to TANESCO under the terms of a 20-year power purchase agreement. The Government said it had secured a credit from the International Development Association (IDA) and intended to apply part of the proceeds of the credit to finance the conversion study which is expected to start in December and last for one and a half months. The major source of Tanzania’s electricity is from hydro power plants. However, because of incessant drought associated with power rationing, inviting the private sector to engage in power generation was seen as one way of getting rid of the problem. TANESCO’s tough new South African management took the drastic step of cutting off power to Zanzibar for three hours one day in July and vowed to continue cutting power to the islands if power bills were not settled. TANESCO Director General Rudy Huysen said power was restored after Tshs. 174 million was paid by the Zanzibar Fuel and Power Corporation (ZFPC) as part of its monthly bill of about Tsh. 419 million. The construction of the Songo Songo natural gas pipeline, which is likely to greatly improve the power supply situation in Tanzania, is proceeding apace and is scheduled for completion in May next year. However, the media report that local job seekers, who were hoping to secure jobs with the company undertaking the project, have been expressing anger that the contractor had hired foreigners, mostly Indians, for menial jobs which could be done by locals. Tanzania Breweries Limited (TBL) has said that the company is experiencing about 20 -30 per cent decline in sales following Dar Es Salaam Regional Commissioner Yusufu Makamba’s order for bars to close at 11.00pm. TBL Public Relations Manager Aggrey Marealle said that about 20,000 bar attendants had lost their jobs in the 4,000 bars and other alcohol outlets officially registered in Dar Es Salaam. He told the press that it was most likely the Government would suffer in revenue collections following the beer sales decline. He said that on average bar owners who were selling about 15 crates of beer a day were now selling about eight. He agreed that there was a 1968 law prohibiting drinking after 11.00pm but said that times had changed, which made the law redundant. The law was passed when the main economic activity was agriculture but today a variety of activities were performed in the urban areas. He said Dar Es Salaam alone accounted for 40% of all commercial activities and that any hitches in the way commerce was conducted in the city would have grave economic consequences – Mwananchi. Ilala MP and former cabinet minister Iddi Simba (who also has a seat on the CCM National Executive Committee (NEC), has reignited the debate on the sensitive and delicate issue of indigenisation in Tanzania. He has published a book on the subject which has stirred up considerable controversy. He believes that indigenous Tanzanians, as distinct from Asian Tanzanians, should be favoured under government economic policies. He was immediately accused of racism. However, on page 16 of the book he writes: “The process of indigenisation of Tanzania, and whatever means which the Government and civil society may devise to empower the disadvantaged groups, will be borne from a sense of common logic and benevolence, not racism…. He said that during the colonial period indigenous populations were marginalized and were not on an equal footing with other races, a problem he is determined to solve. Summarising the background, Evarist Kagaruki, writing in The Express (July 3) pointed out that the debate initially emerged in the early 1990s following the commencement of the process of privatisation in the country. The ruling CCM party reacted quickly to Simba’s book and issued a statement banning the use of the concept of Uzawa within the party on the grounds that it had racist connotations. A number of academics and politicians from the opposition then strongly criticised the CCM statement. Opposition leader in parliament, Wilfred Lwakatare, said that by banning discussion CCM was running away from its own shadow. NCCR Chairman James Mbatia and CHADEMA Chairman Bob Makani supported the policy saying the large majority of Tanzanians who were sidelined by colonial masters must be empowered in order to rectifY the injustices done over the years. President Mkapa reiterated CCM’s stand on uzawa insisting that the ruling party’s policy was geared towards empowerment of all Tanzanians economically regardless of race or origin. The uzawa attitude could fuel unnecessary hatred by segregating certain segments of the Tanzanian people. Nipashe has reported a possible split in the CCM party between those who support the policy and those who are closer to the national leadership who oppose it. The paper said that those who oppose it mostly want to sideline former Commerce Minister Iddi Simba who is leading the struggle for uzawa. On August 13 Iddi Simba said he still stood by his concept of indigenisation, but wanted to shift the emphasis to indigenous Tanzanian (Watanzania asili) rather than African Tanzanians (wazawa). A policy for protecting the economic interests of indigenous Tanzanians was yet to come out. He also said that Tanzania, being a member of the Southern African Development Community (SADC), would also fall under the proposed SADC customs union, but no preparations for protecting the economic rights of poor Tanzanians had been made. “Under the customs unions we will be talking about a free labour market meaning that our hawkers (machinga), food vendors (mamalishe), clerks and other labourers will have to compete on an equal footing with foreigners looking for the same jobs,” he said. Former President Mwinyi, then entered the debate by reiterating his concept of ruksa (liberal thinking). Addressing young parliamentarians he was cheered when he urged them to spearhead the debates on youth participation in the development process. “I am saying you are free to grow. All youths are free to debate on this issue in whatever place in the country”. The former President was followed at the meeting by Iddi Simba who said in 15 years to come he and former President Mwinyi would not be around to advise and, if they would be, then they wouldn’t be strong enough to call the shots. The Guardian reported on July 2 that the Prevention of Corruption Bureau (PCB) was investigating Prime Minister Frederick Sumaye to determine if he had been involved in corruption. This followed allegations of corruption leveled by Democratic Party (DP) chairman Reverend Christopher Mtikila. However, State Minister in the President’s Office (Good Governance) Wilson Masilingi told parliament that allegations leveled against the Prime Minister were not sufficient to make him resign. He said that if such flimsy accusations were taken seriously then the whole cabinet could be asked to resign as Mtikila could keep on asking for resignations in order to give the investigating body freedom to work on any allegations he made. He asked the parliamentarians to use their constitutional right to impeach the Prime Minister if they thought they had sufficient evidence. Masilingi gave one example to prove Sumaye’s innocence saying claims that he had shares in ‘Africa One’ airline had been proved untrue. On August 7 Rai reported that the Government had ordered the PCB to stop investigating the PM. The paper quoted ‘reliable reports’ as saying that the order was from high up the leadership hierarchy on grounds that Mtikila’s allegations were too political and lacked truth. The Guardian reported that on August 6 President Mkapa had ‘blasted corrupt academicians and researchers who produced half-cooked research findings to please the donors financing their work. In a speech to the ‘Southern African Forum Against Corruption’, the President said that like political corruption, intellectual corruption was more dangerous than other forms such as bureaucratic corruption. “We have academics and researchers who produce research findings or evaluation reports to the tune picked by the payer. And sometimes government decisions, in either donor or aid-receiving countries, are based on such research findings or evaluation reports ….. Plagiarism in academic life, half-truths in the media, selective presentation and extrapolation of facts, are all in the broader realm of corruption. And what is worse is that they corrupt the mind,” he said. Meanwhile, the PCB has uncovered a tax evasion scam of 47.3bn/­committed by giant oil marketing companies between 1996 and 1997 who had avoided paying duties and plunged the government into a massive revenue loss amounting to about 83.3bn/-. The PCB also revealed huge tax evasion amounting to billions of shillings involving dubious importation, mainly from Kenya, of khanga & vitenge, tyres, cooking oil, and dry cells (batteries). Through either non-declaration or using fake documents, the Government had lost some Shs 10 billion. The Tanzania revenue Authority (TRA) and the Kenya Revenue Authority were working together to curb tax evasion resulting from undeclared goods passing through their common borders -Guardian. After the new managers of TANESCO on July 22, disconnected power supplies to the whole of Zanzibar -see above -a shadow opposition minister in the Zanzibar House of Assembly complained that Zanzibar was part of the Union and that TANESCO should not have taken the drastic step of disconnecting power and the Minister should apologise. “TANESCO should concede that they are wrong. They had many alternatives to remind Zanzibar to settle its dues. And Union leaders should have criticised the power authority for its hasty decision,” she said. Minister Yona replied that the TANESCO management had the right to collect debts and nobody would be spared. For 12 years Dar es Salaam businessman Devram Valambhia has been locked in a legal wrangle with the Bank of Tanzania over the payment of Shs 55 billion for 800 vehicles and military equipment he supplied to the Government. Finally on July 17 this year the High Court of Tanzania dismissed for lack of merit, an application filed by the Bank seeking leave to set aside a court order requiring the Bank to pay him. Judge Salum Massati also ordered the Bank’s Governor to appear in court to show cause why he had not paid the money to Valambhia earlier. The Governor did not appear and later it was stated that the Government did not have the money to pay. Valambhia’s advocates recently told the court that they had secret documents showing communications between the then Finance Minister, the late Kighoma Malima, and the firm; Valambhia had been arrested and detained for five months without bail. The High Court was told on August 12 that corruption might have played a role deterring some authorities in both the Government and the Bank of Tanzania (BoT) from paying the Shs 55bn/ debt to Valambhia. Counsel for Valambia, Moses Maira and Mabere Marando, made the submission to the court in respect of an order of the court to the Governor of the BoT, to show cause why he should not go to jail for failure to appear when summoned. A decision of the court is due in October. The Reverend Dr. Fidon Mwombeki from the Evangelical Lutheran Church of Tanzania (ECLT) has challenged the Government to name the people who signed the Independent Power Tanzania Limited (IPTL) agreement (see above) so that they can be investigated further for causing hardships to Tanzanians. He said the public would like to know their level of education and if the signatories understood what they were signing -Majira. Ame Mpungwe, former Tanzania Ambassador to Pretoria, has denied accusations that he sold his country. He said he was neither the Parastatal Sector Reform Commission (PSRC) nor was he one of the PSRC commissioners. He said that anyone having the post of ambassador was merely a glorified messenger. Mpungwe’s defense came amid accusations that he might be the one who had helped many South African companies to acquire privatized Tanzanian enterprises -Mtanzania. Former President Ali Hassan Mwinyi recently advised Muslims not to use the Koran as a pretext for causing trouble, which ended up endangering the country’s peace and harmony. Closing a symposium for Muslim leaders on peace, unity and development he called on Muslim youth to learn the true meaning of the verses of the Koran which would help them avert misunderstandings between them and followers of other religions. Mwinyi attributed turmoil in Muslim populated areas to the preaching of violence by some Muslim leaders -Nipashe. The Muslim organisation BAKWATA has complained about the rapidly mushrooming bars, alcohol selling outlets and brothels in Dar Es Salaam and has advised its leader, Chief Sheikh Mufti Issa Shaaban bin Simba, to ask the Government to deal with the situation. -Mwananchi. Muslim activists staged a demonstration in Dar Es Salaam in late June and marched through the streets demanding that the US ‘leaves Tanzania alone and not make it its colony’. The activists failed to breach security force barriers on their way to the US embassy. They were protesting against the detention by security agents of certain Muslim leaders and carried placards conveying messages such as ‘Murder, robbery and deception is the American way’, ‘Afghanistan, Iraq and now Tanzania’ ‘Are terrorists Muslims only?’ and ‘The President of Tanzania is like Bush’ -Mwananchi. Muslims in Morogoro are showing signs of division. There are said to be two groups -a moderate group led by the Regional Bakwata Imam, Omar Bafadhil and a radical group led by the Morogoro District Imam, Sheikh Mohamed Kairo, who favours anti-Government preaching in mosques. Sheikh Bafadhil is reported to be irritated by a group of radicals turning the mosque into a political platform with radical imams from Dar Es Salaam preaching anti-Government sentiments and advocating violence against non­Moslems -An Nuur. In Zanzibar the Government is said to be looking into the possibility of removing all alcohol selling centres and bars from residential areas -An Nuur. Beauty contests are under fire again in Tanzanian religious circles. The Observer (August 10) interviewed several people: “The government, being the custodian of peace, tranquillity and integrity of the country, has a moral responsibility to safeguard the cultural and religious sentiments of her people, who mandated it to power, otherwise it is betraying them,” said Abdulrahman Kungo, an outspoken Muslim. He pointed out that beauty contests destroyed the moral integrity of teenage boys and girls …… ” Beauty contests are tantamount to rebuking God’s creation. No human being can say a particular girl is better or more beautiful than another.” Mary Kessy, of the Tanzania Women Lawyers Association (TAWLA), said that beauty contests should be stopped; the Government should first ban dresses worn nowadays by most teenage girls which exposed their bodies, contrary to the norms and traditions of the nation. …. Beauty contests exposed the behaviour, nakedness and body structure of a particular lady, which is a shameful act to all of us, she said. The Auxiliary Bishop of the Roman Catholic Archdiocese of Dar es Salaam, Methodius Kilaini, said that the Church was studying carefully the bad effects of beauty contests and to what extent these activities were destroying the behaviour of teenagers in the country and going against religious ethics. Muslims in Dar Es Salaam erected a fence around the Karume cemetery in a bid to bar Ilala Municipal Council workers from digging up the graves and relocating them to Segerea, 15 kms from the city. The Muslims claimed that it was against their faith to dig up graves for unimportant reasons. A 100­man squad was then left guarding the cemetery to keep at bay any Ilala municipal workers who might wish to continue with the relocation of the graves. Speaking to journalists at the site, the Secretary of a Muslim Rights committee, Sheikh Ponda Issa Ponda, who was quoted in Mtanzania said the Ilala Municipality was not certain on what exactly was to be built at the other area which made the move a farce. He said there were many areas in the city that could be used to erect whatever the municipality wanted to build instead of disturbing eternally resting Muslims. On August 15 Ilala District Commissioner Captain Seif Mpembenwe said that Muslim activists camped at Karume cemetery would be removed by force because they had failed to heed a court order by the Ilala District court requiring them to do so. In a related story the activists warned against anyone setting foot on the cemetery saying stern measures would be taken against them. In yet another related story Dar Es Salaam residents of Manyema descent from Kigoma and the Congo have come forward to claim the cemetery as theirs and criticised the Government for acting without consulting them. Fears of a split in the Catholic Church in Tanzania have grown amid reports that a fundamentalist group preaching contrary to the beliefs of many has defied Cardinal Polycarp Pengo’s orders to stop such preaching. The rebellious group calling itself Karismatiki is said to preach contrary to the beliefs of the Catholic Church that Mary is the Mother of God and that the Holy Ghost really exists. Cardinal Pengo repeated his orders for the group to stop the unholy preaching that turned it into fundamentalism -Majira.